At Master Mechanic, we’ve been fixing cars since 1982. In that time, we’ve heard every question you can possibly think of. You may think your question is too basic to ask a pro, but you’d be surprised how many people are scratching their heads over the same thing. While we’re experts at working on cars, we appreciate that you might not be. That’s why we love taking the time to explain things to our customers and always make sure they understand what we’re doing. Below we rounded up some of the more common questions that come our way. If there’s something not on the list, contact your local Master Mechanic and we’ll be happy to help. Check your owner’s manual for specifics. While newer vehicles have oil change intervals that are monitored by the vehicle’s computer and the interval calculated this this only works for the first number of kilometers. As your vehicle ages and the kilometers rack up, the engine wears and produces more contaminants for the engine oil to manage. These added contaminants require the oil being changed more frequently than the vehicle’s computer may suggest. Come and talk with our technicians and they can assess your driving habits and suggest a more suitable oil change interval to keep your vehicle performing the best it can. 2. How often should I rotate my tires? Although many people overlook this service altogether, most manufacturers recommend you rotate your tires every 10,000 kilometres–and so do we! If you don’t know how long it’s been, come visit and we will check your tread depth and recommend the best way for you to get the most life from your tires. 3. What does it mean if my check engine light is on? While we’re car experts, we’re not mind-readers. If your check engine light is on, that indicates there’s an emission or drivability issue with your car. The light means that an error code has recorded and is stored inside your vehicle’s onboard computer. To know exactly what’s wrong, you need to bring your car into Master Mechanic to have it diagnosed. The car’s computer will not actually tell us what the problem is, but it will show us what system has malfunctioned. From there, we can begin to determine the problem and how to fix it. Once we figure it out, we’ll always explain exactly what’s wrong before we do any work, so that you can make an informed decision. 4. Can I come to Master Mechanic if my car is still under warranty? Contrary to popular belief, you don’t need to bring your car back to the dealership for maintenance while it’s under warranty. At Master Mechanic, we perform all of the same routine maintenance as your dealer. In fact, according to Consumer Reports, independent shops outscore dealerships in “overall satisfaction, price, quality, courteousness of the staff, and work being completed when promised”. But, we could have told you that! 5. Do you provide a warranty? • 3 months or 5,000 kilometres for labour* for your vehicle anywhere in North America. 6. Will my car break down if I maintain it properly? Some people want their car to last forever. We understand that. With proper maintenance, your vehicle is less likely to break down and will stay reliable for longer. However, cars are machines, and machines break down. Our goal at Master Mechanic is to take preventative measures to make sure we fix issues before they leave you without a car. 7. 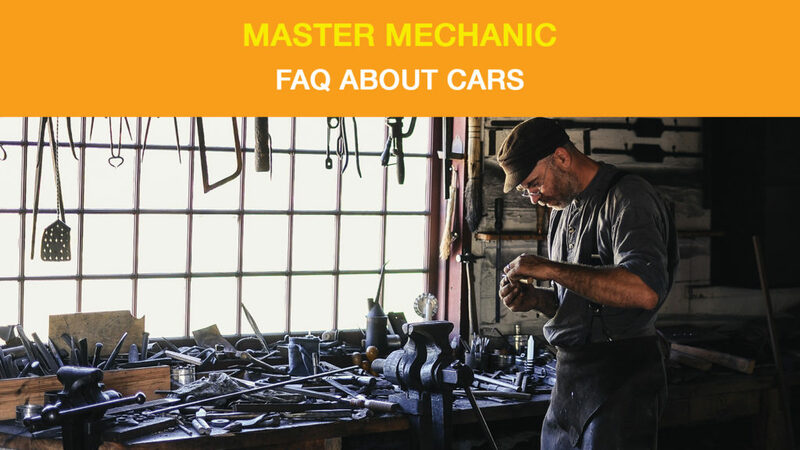 Are Master Mechanic technicians qualified? All of our technicians either hold Certificates of Qualification or are registered apprentices and are hand-selected by the owners of our shops. In all cases, technicians are employees of the shop, not contractors, so you can expect to build a rapport with them over time. Master Mechanic’s strong commitment to our Technical Excellence Program drives our passion and ability to take on the toughest technical diagnostic challenges. We stay up-to-date on all industry changes and emerging technologies to keep your vehicle safe and running smoothly. Those are some of the more common questions we receive on a day-to-day basis. We love hearing from customers and the community, so if you have any questions don’t hesitate to contact your local Master Mechanic today! We’re here to help!